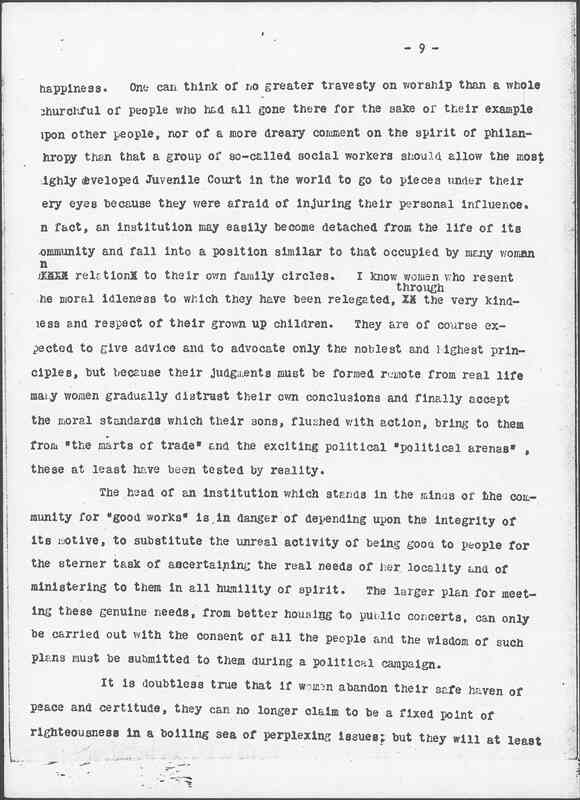 When I am asked why I allied <identified> myself with a political party, the question almost always implies a regret that I should have weakened my "Influence among philanthropic lines" by thus making a political alliance. 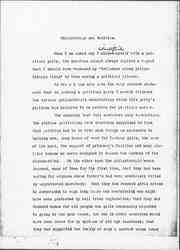 In reply I can only make the very sincere statement that in joining a political party I merely followed the various philanthropic undertakings which this party's platform had declared to be matters for political action. The campaign last fall contained many revelations. 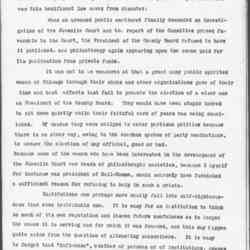 The oldtime politicians were doubtless surprised to find that politics had to do with such things as accidents to working men, long hours of work for factory girls, the care of the aged, the support of prisoners' families and many [similar] humane measures designed to lessen the burdens of the disinherited. 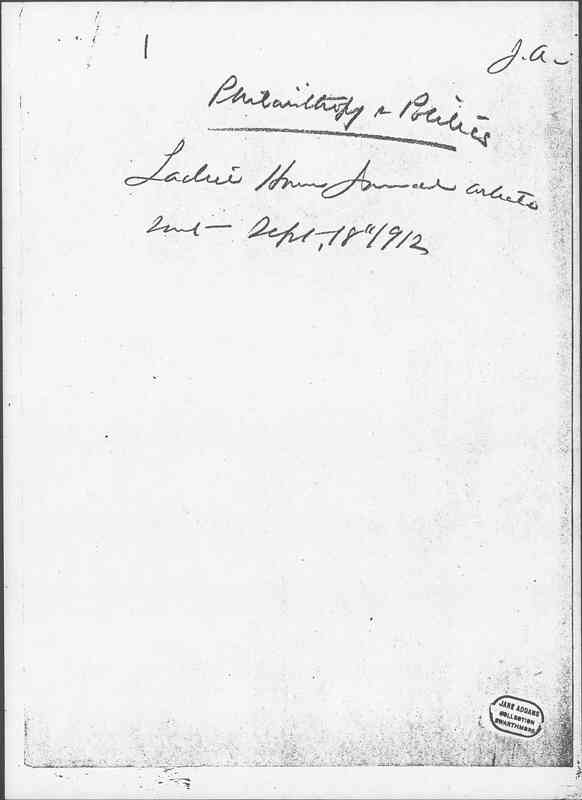 On the other hand the philanthropic women learned, many of them for the first time, that they had been caring for orphans whose father's had been needlessly killed by unprotected machinery; that they had rescued girls driven to desperation through long hours and overstraining who might have been protected by well tried legislation; that they had founded homes for old people who quite reasonably objected to going to the poor house, but who in other countries would have been cared for by systems of old age insurance; that they had supported the family of many a convict whose labor [page 2] was addng to the profits of a prison contractor whose <while his> wife and children were dependent upon charity. 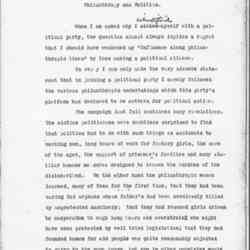 It was not strange that when a political party considered such matters in their first convention that women were asked to participate, it would in fact have been very unnatural if they had been excluded. In fact, the line between philanthropy and politics is so constantly changing that it is very difficult to know when the step has been taken which carries one from the first sphere into the second. One can illustrate this by the nation-wide effort to secure clean milk, upon which the health of tenement house babies so absolutely depends. When we consider that two hundred thousand babies under one year of age die every year <annually> in the United States and that it is estimated that one hundred thousand of these deaths could be prevented by proper care, we realize how important such an effort is. 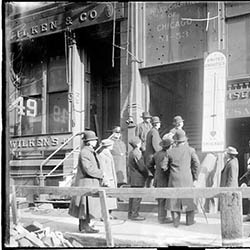 At one time milk stations were established in all the poorer quarters of Chicago, where the mothers of sick children might buy pastuerized and modified milk, the United Charities of the city supplementing this by caring for ailing babies in hospital tents upon spaces and roofs. Although the milk stations were useful, it was found impossible to have sufficient number of them. 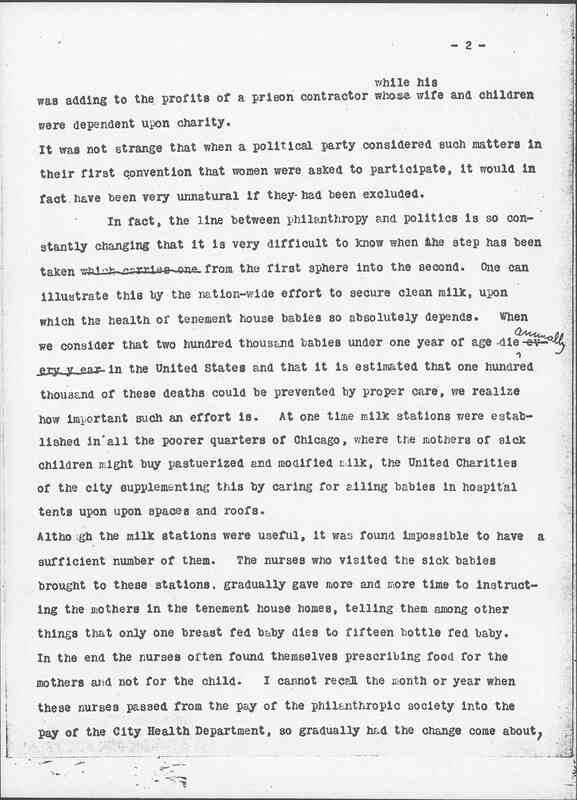 The nurses who visited the sick babies brought to these stations, gradually gave more and more time to instructing the mothers in the tenement house homes, telling them among other things that only one breast fed baby dies to fifteen bottle fed baby. In the end the nurses often found themselves prescribing food for the mothers and not for the child. 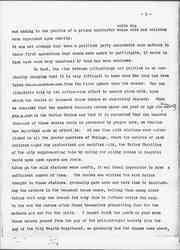 I cannot recall the month or year when these nurses passed from the pay of the philanthropic society into the pay of the City Health Department, so gradually had the change come about, [page 3] nor when the woman physician who was a resident of the University Settlement became a city official, although she did not thereby cease to be a "social worker." 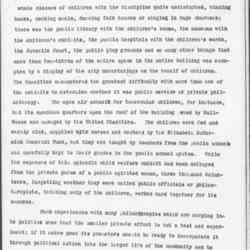 At the present moment, this corps of nurses who go in and out of the tenement houses during all the hot summer months to save the lives of helpless children, act as school nurses during the school year. They are protected by civil service examinations and have become a permanent part of the municipal activity of Chicago. Their ministrations, formerly called philanthropic, are now designated as civic. But the effort to secure clean [milk] demanded more than that, it was of no use to instruct mothers how to care for milk which had been already defiled and poisoned before it reached them. 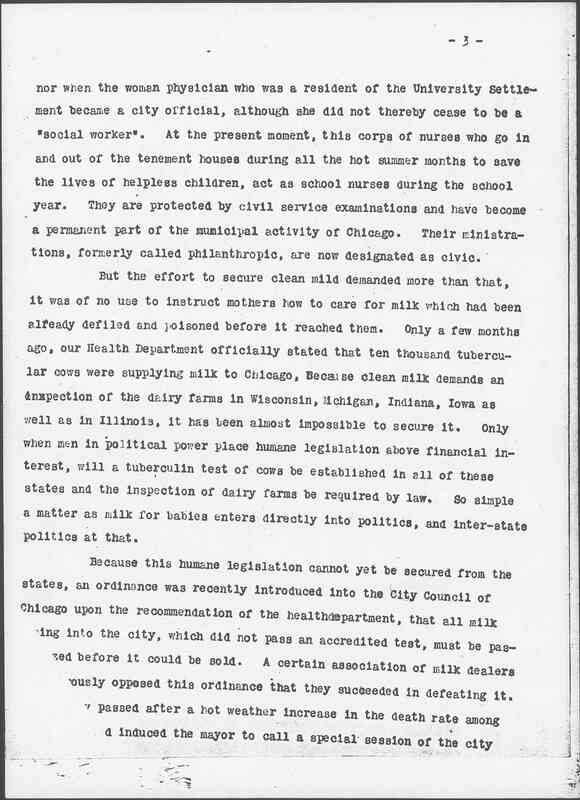 Only a few months ago, our Health Department officially stated that ten thousand tubercular cows were supplying milk to Chicago. Because clean milk demands an inspection of the dairy farms in Wisconsin, Michigan, Indiana, Iowa as well as in Illinois, it has been almost imposible to secure it. 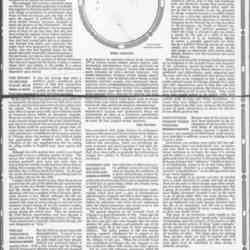 Only when men in political power place humane legislation above financial interest, will a tuberculin test of cows be established in all of these states and the inspection of dairy farms be required by law. So simple a matter as milk for babies enters directly into politics, and inter-state politics at that. 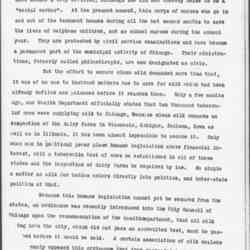 Because this humane legislation cannot yet be secured from the states, an ordinance was recently introduced into the City Council of Chicago upon the recommendation of the health department, that all milk [going] into the city, which did not pass an accredited test, must be pasteurized before it could be sold. A certain association of milk declares previously opposed this ordinance that they succeeded in defeating it. 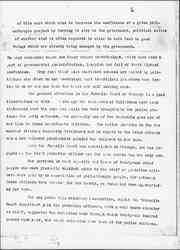 [illegible] passed after a hot weather increase in the death rate among [illegible] induced the mayor to call a special session of the city [page 4] council to consider the protection of Chicago's children against unwholesome milk. 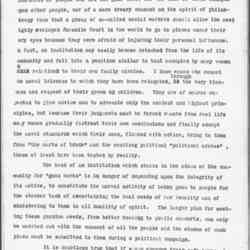 When I was asked by a committee of aldermen to address an open meeting of the city council on the milk ordinance, I found the council chamber filled with the philanthropic workers of Chicago who were desperately discouraged because all of their efforts to save the children had been frustrated by a few selfish milkmen of the city. <It was only> two days later however, when I attended the first convention of the new party, I found among its delegates scores of people whom I had formerly known in connection with philanthropic associations of national scope. 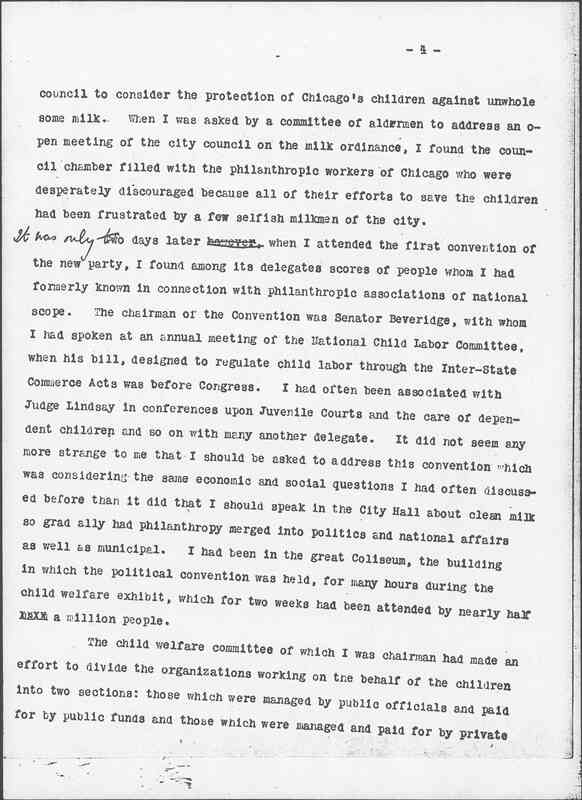 The chairman of the Convention was Senator Beveridge, with whom I had spoken at an annual meeting of the National Child Labor Committee, when his bill, designed to regulate child labor through the Inter-State Commcerce Acts was before Congress. 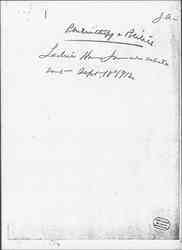 I had often been associated with Judge Lindsay in conferences upon Juvenile Courts and the care of dependent children and so on with many another delegate. 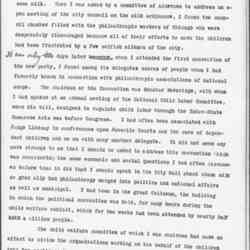 It did not seem any more strange to me that I should be asked to address this convention which was considering the same economic and social questions I had often discussed before than it did that I should speak in the City Hall about clean milk so gradually had philanthropy merged into politics and national affairs as well as municipal. 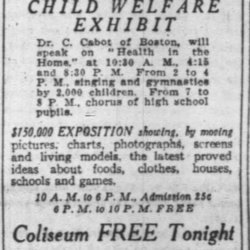 I had been in the great Coliseum, the building in which the political convention was held, for many hours during the child welfare exhibit, which for two weeks had been attended by nearly half a million people. 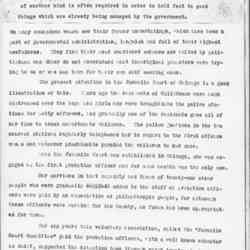 The child welfare committee of which I was chairman had made an effort to divide the organizations working on the behalf of the children into two sections: those which were managed by public officials and paid for by public funds and those which were managed and paid for by private [page 5] philanthropy. In the first was the splendid display of the public schools, whole classes of children with the discipline quite undisturbed, binding books, cooking meals, dancing folk dances or singing in huge choruses; there was the public library with the children's rooms, the museums with the children's exhibits, the public hospitals with the children's wards, the Juvenile Court, the public play grounds and so many other things that more than two-thirds of the entire space in the entire building was occupied by a display of the city undertakings on the behalf of children. The Committee encountered the greatest difficulty with more than one of the exhibits to determine whether it was public service or private philanthropy. 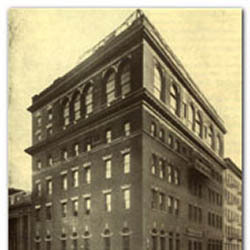 The open air school for tubercular children, for instance, had its spacious quarters upon the roof of the building owned by Hull-House and managed by the United Charities. 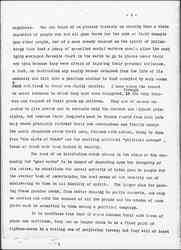 The children were fed and warmly clad, supplied with nurses and doctors by the Elizabeth McCormick Memoral Fund, but they are taught by teachers from the public schools and carefully kept to their grades in the public school system. 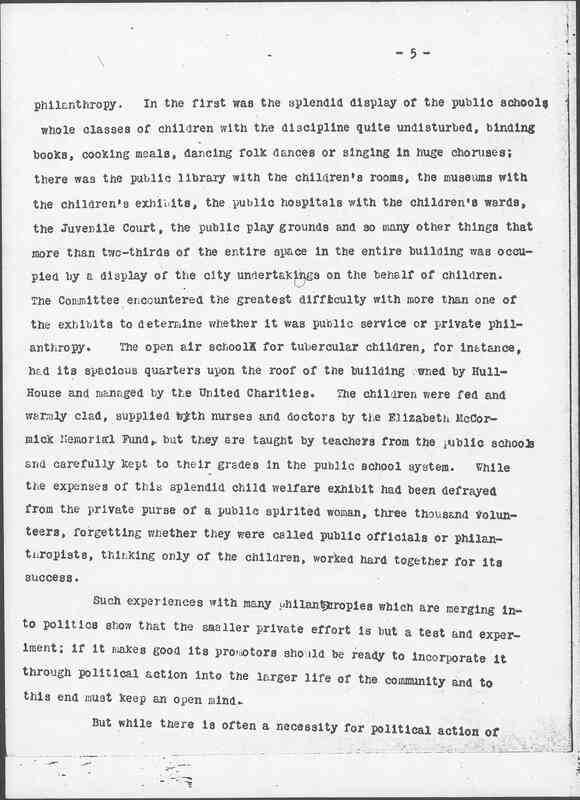 While the expenses of this splendid child welfare exhibit had been defrayed from the private purse of a public spirited woman, three thousand volunteers, forgetting whether they were called public officials or philanthropists, thinking only of the children, worked hard together for its success. Such experiences with many philanthropies which are merging into politics show that the smaller private effort is but a test and experiment; if it makes good its promoters should be ready to incorporate it through political action into the larger life of the community and to this end must keep an open mind. 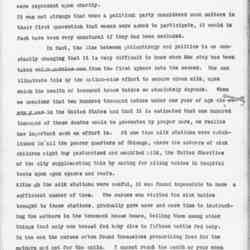 But while there is often a necessity for political action of [page 6] this sort which aims to increase the usefulness of a given philanthropic project by turning it over to the government, political action of another kind is often required in order to hold fast to good things which are already being managed by the government. 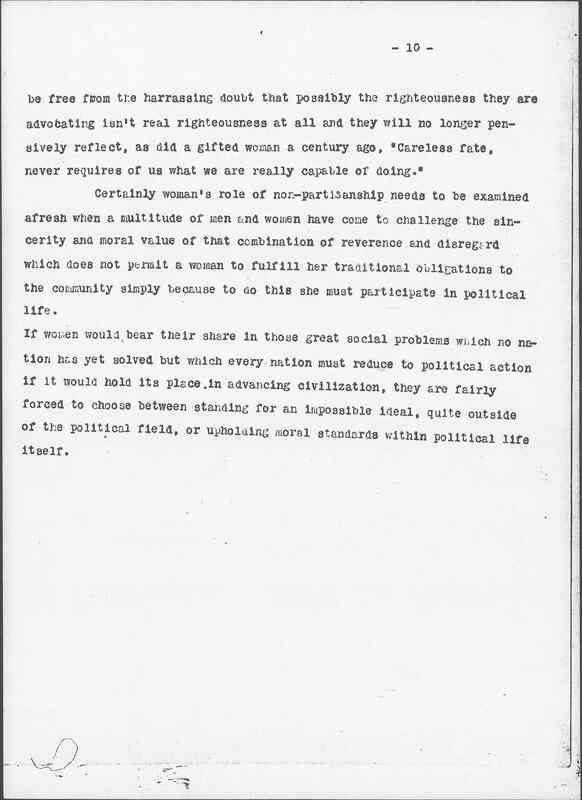 On many occasions women see their former undertakings, which have been a part of governmental administration, languish and fail of their lightest usefulness. They find their most cherished schemes are talked by politicians who either do not understand what the original promoters were trying to do or who use them for their own self seeking ends. The present situation in the Juvenile Court of Chicago is a good illustration of this. 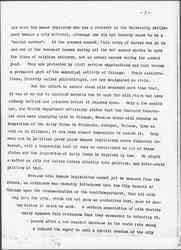 Years ago the residents of Hull-House were much distressed over the boys and girls who were brought into the police stations for petty [offenses], and gradually one of the residents gave all of her time to these unfortunate children. 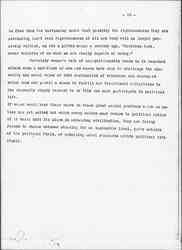 The police justices in the two nearest stations regularly telephoned her in regard to the first [offense] cases and whenever practicable paroled the children to her care. 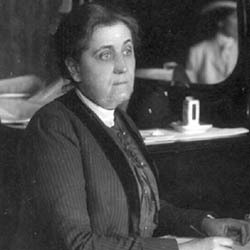 When the Juvenile Court was established in Chicago, she was engaged as the first probation officer and for some months was the only one. 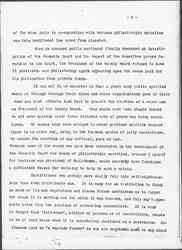 Her services in that capacity and those of twenty-one other people who were gradually [engaged] added to the staff of probation officers were paid by an association of philanthropic people, for although these officers were working for the County, no funds had been appropriated for them. 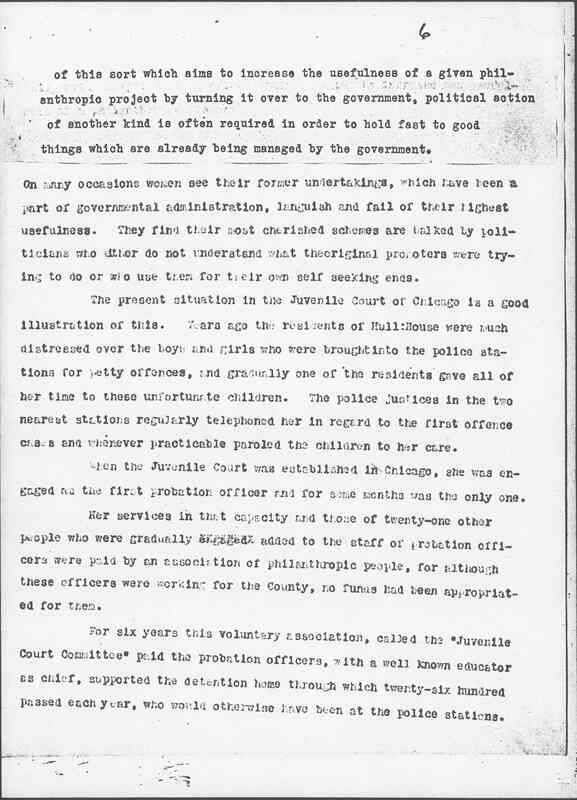 For six years this voluntary association, called the "Juvenile Court Committee" paid the probation officers, with a well known educator as chief, supported the detention home through which twenty-six hundred passed each year, who would otherwise have been at the police stations. 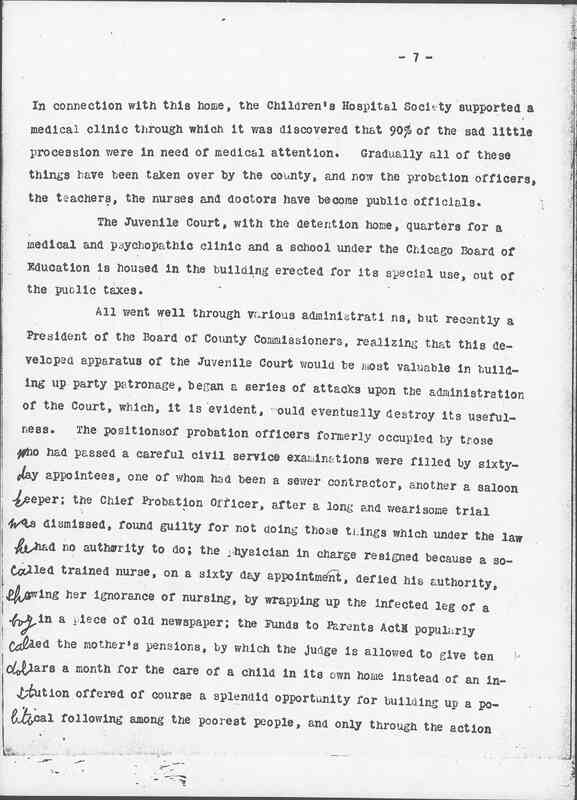 [page 7] In connection with this home, the Children's Hospital Society supported a medical clinic through which it was discovered that 90% of the sad little procession were in need of medical attention. Gradually all of these things have been taken over by the county, and now the probation officers, the teachers, the nurses and doctors have become public officials. 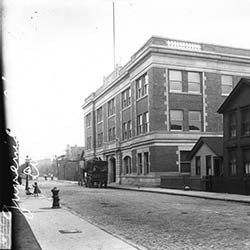 The Juvenile Court, with the detention home, quarters for a medical and psychopathic clinic and a school under the Chicago Board of Education is housed in the building erected for its special use, out of the public taxes. 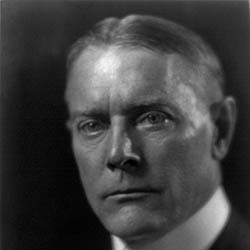 All went well through various administrations, but recently a President of the Board of County Commissioners, realizing that this developed apparatus of the Juvenile Court would be most valuable in building up party patronage, began a series of attacks upon the administration of the Court, which, it is evident, would eventually destroy its usefulness. 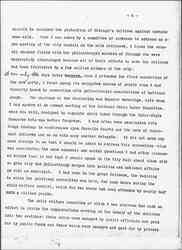 The positions of probation officers formerly occupied by those who had passed a careful civil service examinations were filled by sixty-day appointees, one of whom had been a sewer contractor, another a saloon keeper; the Chief Probation Officer, after a long and wearisome trial was dismissed, found guilty for not doing those things which under the law he had no authority to do; the physician in charge resigned because a so-called trained nurse, on a sixty day appointment, defied his authority, showing her ignorance of nursing, by wrappng up the infected leg of a boy in a piece of old newspaper; the Funds to Parents Act popularly called the mother's pensions, by which the judge is allowed to give ten dollars a month for the care of a child in its own home instead of an institution offered of course a splendid opportunity for building up a political following among the poorest people, and only through the action [page 8] of the wise judge in co-operation with various philanthropic societies was this benificent law saved from disaster. 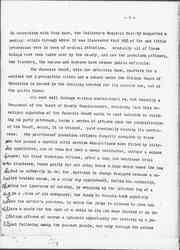 When an aroused public sentiment finally demanded an investigation of the Juvenile court and the report of the Committee proved favorable to the Court, the President of the County Board refused to have it published, and philanthropy again appearing upon the scene paid for its publication from private funds. 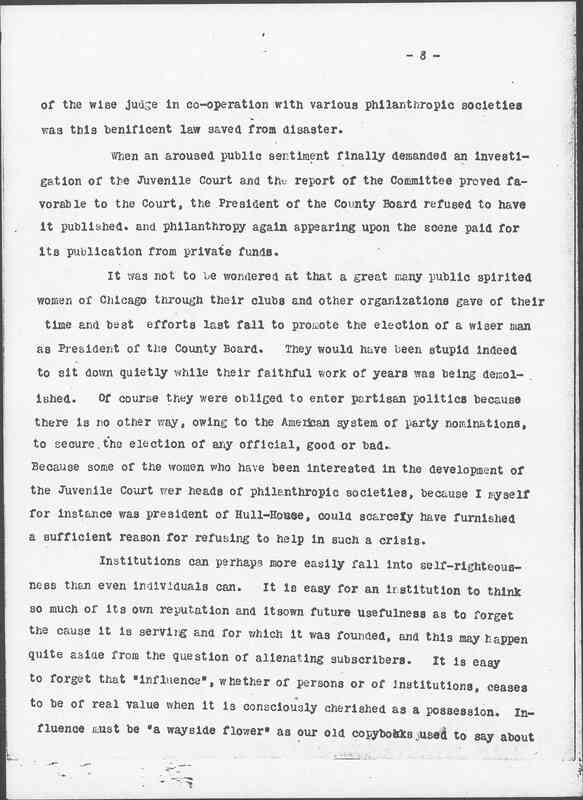 It was not to be wondered at that a great many publuc spirited women of Chicago through their clubs and other organizations gave of their time and best effrots last fall to promote the election of a wiser man as President of the County Board. They would have been stupid indeed to sit down quietly while their faithful work of years was being demolished. Of course they were obliged to enter partisan politics because there is no other way, owing to the American system of party nominations, to secure the election of any official, good or bad. 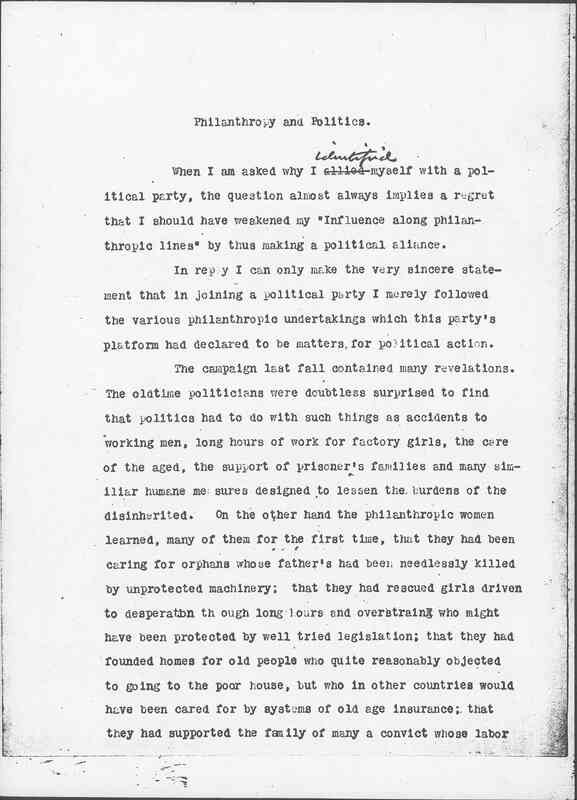 Because some of the women who have been interested in the development of the Juvenile Court were heads of philanthropic societies, because I myself for instance was president of Hull-House, could scarcely have furnished a sufficient reason for refusing to help in such a crises. Institutions can perhaps more easily fall into self-righteousness than even individuals can. 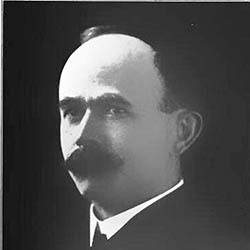 It is easy for an institution to think so much of its own reputation and its own future usefulness as to forget the cause it is serving and for which it was founded, and this may happen quite aside from the question of alienating subscribers. It is easy to forget that "influence," whether of persons or of institutions, ceases to be of real value when it is consciously cherished as a possession. 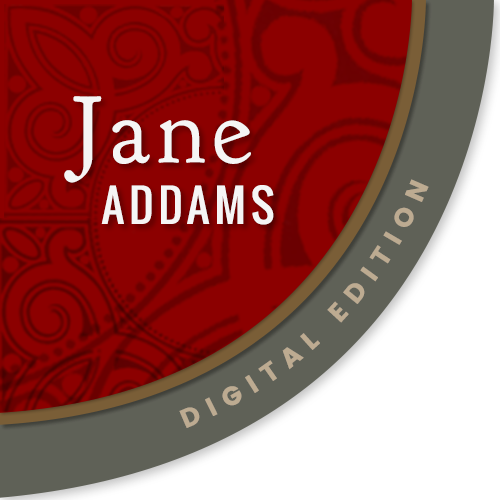 Influence must be "a wayside flower" as our old copybooks used to say about [page 9] happiness. One can think of no greater travesty on worship than a whole churchful of people who had all gone there for the sake of their example upon other people, nor of a more dreary comment on the spirit of philanthropy than that a group of so-called social workers should allow the most highly developed Juvenile Court in the world to go to places under their [very] eyes because they were because they were afraid of injuring their personal influence. [In] fact, an institution may easily become detached from the life of its community and fall into a position similar to that occupied by many woman <[in]> relation to their own family circles. I know women who resent [the] moral idleness to which they have been relegated, <through> the very kindness and respect of their grown up children. 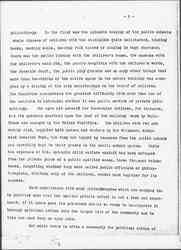 They are of course expected to give advice and to advocate only the noblest and highest principles, but because their [judgements] must be formed remote from real life many women gradually distrust their own conclusions and finally accept the moral standards which their sons, flushed with action, bring to them from "the marts of trade" and the exciting political "politcal arenas," these at least have been tested by reality. 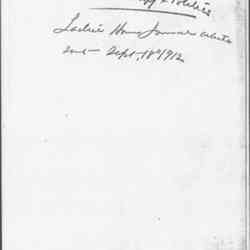 The head of an institution which stands in the minds of the community for "good works" is in danger of depending upon the integrity of its motive, to substitute the unreal activity of being good to people for the sterner task of accertaining the real needs of her locality and of ministering to them in all humility of spirit. The larger plan for meeting these genuine needs, from better housing to public concerts, can only be carried out with the consent of all the people and the wisdom of such plans must be submitted to them during a political campaign. 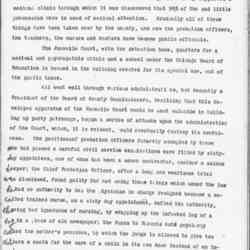 It is doubtless true that if women abandon their safe haven of peace and certitude, they can no longer claim to be a fixed point of righteousness in a boiling sea of perplexing issue; but they will at least [page 10] be free from the [harassing] doubt that possibly the righteousness they are advocating isn't real righteousness at all and they will no longer pensively reflect, as did a gifted woman a century ago, "Careless fate, never requires of us what we are really capable of doing." 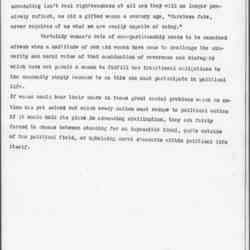 Certainly woman's role of non-partisanship needs to be examined afresh when a multitude of men and women have come to challenge the sincerity and moral value of that combination of reverence and disregard which does not permit a woman to fulfill her traditional obligations to the community simply because to do this she must participate in political life. 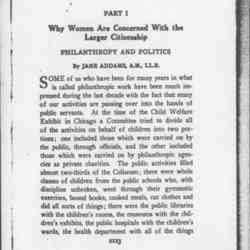 Addams, Jane, “Philanthropy and Politics, September 18, 1912,” Jane Addams Digital Edition, accessed April 22, 2019, https://digital.janeaddams.ramapo.edu/items/show/8867.